Spring is here! 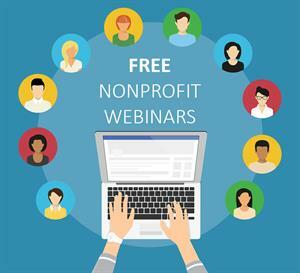 Start it the right way by learning something new from our list of free nonprofit webinars the internet has to offer. While you're at it, why not learn the 3 keys to growing your organization with content directly from Wild Apricot's own Tatiana Morand? Topics this month include how to build relationships using content, legal advice for nonprofit websites, convincing your board to fundraise, Google Ad grant help, and more! Without further ado, here are all the free nonprofit webinars happening in April with times indicated in EST. Is your intranet an essential portal for communication, collaboration, and integration? That was the question we recently asked ourselves at Caltech. In this webinar, you will hear about best practices and lessons learned in designing, launching, maintaining, and improving an effective staff intranet from Mark Longo and Anna Pruszynska-Garcia. Join us on our journey of intranet evolution--from concept, through growing pains of the first iteration, and ultimately, to the new, central platform that ignited a revolution in the way we work. The concept of robots replacing the human workforce is controversial. But, as digital transformation continues to impact business performance across the globe, cutting-edge technologies are allowing employees to focus on value-added activities instead of mundane tasks. With the introduction of robotic process automation (RPA), a technology that automates repetitive processes, organizations are driving more revenue, increasing margins, and controlling expenses. Join our panel discussion with Blackbaud CFO Tony Boor as we discuss how your institution can adopt this technology today and how it’s impacting our own business processes. You’ve been tasked with writing your first grant proposal for your organization, and you have no idea where to start. What information goes in which section? Are you using enough data? How much money should you ask for? If you’re new to grant writing, the process can seem convoluted, overwhelming, and stressful. We know the feeling! At Elevate we’ve worked with over 100 nonprofit organizations to win millions of dollars for their programs, and we’ve learned a thing or two about what constitutes a winning grant (and the mistakes to avoid). In this FREE one-hour webinar, we’ll walk you through basic do’s and don’ts to help you write your first grant with confidence. The #1 thing most new grant writers forget to do before they submit a grant. This free training is ideal for anyone new to fundraising and grant writing for nonprofits. It’s also helpful for grant writing professionals looking for a refresher, volunteer grant reviewers, anyone interested in exploring a career in grant writing, and those interested in learning a marketable fundraising skill. How do you tell your organization’s story in only 2,500 characters? 150 words? How do you create a storyline for the reviewer to follow when you have numerous fillable fields to complete online that may or may not be read in the order that you complete them on the screen? One of the most common challenges with online applications is how to have your application stand out in a sea of grant applications when you are all faced with the same formatting and character or word limited requirements. In “How to Stand Out From the Crowd in Online Grant Applications” we will address how to create a concise, compelling and competitive application for online grant application scenarios. We will look at specific examples for tips that make reviewing your online grant proposal easier for reviewers. We will also explain how to avoid losing the power of your story when your application is broken up across numerous fields. You want to craft more competitive grant applications. Asking is just one part of a successful fundraising program. The other part -- the big part -- is the relationship building that happens through cultivation and stewardship. If you work with annual level donors, much of this relationship building happens through the content you send to your donors. The question is -- is that content actually doing its job to help you build relationships? Join Vanessa Chase Lockshin for this upcoming webinar to explore what outstanding relationship building content looks like and how your organization can step up its game. In this webinar, the Ontario Nonprofit Network’s decent work for women Project Lead Pamela Uppal will share key findings from their recent reports, the 10 solutions ONN is working on - with particular emphasis on new maternity top-ups and compensation tools, and ways for women workers and nonprofit employers to join the decent work for women movement. While registration is open to all, attendance is limited to the first 1,000 people to sign onto the live session. We suggest signing on five minutes early to have the best chance of getting on the live session. If for any reason you aren't able to connect to the live session, rest assured you'll get the full recording by email the following day. Organizations are often so focused on spreading awareness of their missions and acquiring new supporters that they fail to implement a comprehensive game plan for their newly acquired email addresses. During this webinar, Tammy Radencic, senior consultant at Blackbaud, will show you how to court constituents for the long haul by forming a pipeline of support for newly acquired donors and creating a welcome series to further engage them. Join us to learn how to convert your newest donors into lifelong supporters. How to use the latest in marketing automation to engage your donors. How to convert supporters with powerful landing pages. The key fundamentals to a website that works harder than a brochure site. What you need to consider regarding accessibility. Foundations and nonprofits alike often struggle to communicate effectively about the importance of racial equity in their work. That task has become even more difficult in the current political and social environment in the United States, which is often dominated by division, polarization, and fear. Having the skills to persuade skeptical audiences and activate existing supporters is increasingly necessary for the successful delivery of any organization's mission. Additionally, it is critical to understand the role of different media platforms for reaching and moving disparate audiences. Fortunately, research and experience from around the country point to clear lessons for communicating successfully about equity and promoting positive solutions. In this presentation called, “Shifting the Narrative to Advance Racial Equity,” Alan Jenkins of The Opportunity Agenda will share best practices and new approaches proven to advance equity across issues and communities. He will also share the results of new public opinion and media research, highlight relevant case studies, and offer practical tips designed for donors and nonprofits. Obtain useful information on choosing and maximizing digital platforms is its own topic that would require a separate presentation. more than 10X the engagement over regular emails! Don't you want that for your campaigns? This webinar will focus on the basics of getting started with the Auctria program from basic navigation to planning. Preparing in advance makes for a stress free and successful auction fundraiser. In addition, a member of the Auctria support team will be on the webinar to answer technical questions. Are you the one who ends up staying late to get all the work done at your membership organization? Things like processing registrations, designing newsletters, and updating your website? In this webinar, we'll show you how a typical membership manager uses Wild Apricot, the #1 rated membership management software, to automate 90% of these tasks to save 20 hours a week or more. When the Tax Cuts and Jobs Act was passed by the US Congress in December 2017, there was much wailing and gnashing of teeth in the nonprofit community. The scenarios ranged from the merely devastating to the apocalyptic. With the first tax year under the law just concluded, we now have actual data to evaluate its effects. Larry C Johnson, Founder of The Eight Principles, interprets the early data and shares the significant growth opportunities created by the new legislation. Create donor loyalty even as you drive up giving totals. With all that you are juggling inside your nonprofit organization, from people to finances to fundraising, it is hard to imagine adding another worry, like employee theft, to your over-full plate. This forensic accountant understands that. She also understands just how prevalent theft is inside nonprofit organizations – even those with the best internal controls. Join Tiffany Couch as she moves through understanding fraud risk, and how it doesn’t have to be scary or overwhelming. In fact, managing this risk will actually help you feel more confident in understanding your organization's finances. Using stories from actual cases, you will meet the fraudsters, identify red flags of fraud, understand typical fraud schemes inside a nonprofit, and learn the easy to manage steps to prevent or detect it. This webinar will walk through the basics of crowdfunding so that your nonprofit can utilize this growing fundraising method to bring in more money for your cause. We’ll also include an extra long Q&A portion so no question goes unanswered. If you’ve ever wished for a silver bullet to reach thousands of supporters, grow your email list, or attract more donors, this webinar is for you! Effective storytelling is imperative to your fundraising strategy; it can help create deeper connections with a tribe of loyal and impassioned supporters. But where do you begin? What should your story entail and who should it be about? MobileCause's interactive workshop, Strategic Storytelling for Nonprofits: Crafting Authentic Content that Inspires Donors, is here to help you, step-by-step, make your story come to life. The workshop will discuss why and how great storytelling will reach your intended audience, then work with you through each fundamental element of authentic story and how you can apply it directly to your nonprofit organization and your mission. How we choose to manage donor data directly impacts how we relate with our donors. As transgender people have become more culturally visible, many organizations are making changes to their data management practices to be more inclusive of diverse gender identities. Join us to learn how to update your database processes to respectfully store information about and communicate with your constituents. How to be more strategic in 2019! Raising money for your nonprofit is stressful and exhausting, especially in small-medium sized shops. No matter your size, you must focus on major gifts. Nancy Rieves will share the four critical areas for all nonprofits to master to achieve fundraising success. They are 1) clarifying your messaging, 2) developing fundraising leadership skills, 3) educating and engaging your board in the fundraising process, and 4) enhancing your donor experiences in meaningful ways. Don’t leave fundraising to chance. Get these right and unleash your passion to raise more money for your organization year after year. Learn about the laws and regulations that affect you and your nonprofit organization’s website. Digital skills trainer Yesenia Sotelo will walk you through an informative conversation about topics such as: copyright, privacy, security, accessibility and disclosure. Bring your questions to this interactive training session. (This training is especially created for nonprofit communications, fundraising and executive professionals who are involved in managing their nonprofit organization’s website. The materials are appropriate for organizations of any size, focus area, website budget and technology capacity. A recording will be available! This webinar will help Executive Directors, Finance Directors, and finance staff to build a superior budget. Savvy nonprofit leaders know that effective budgets and projections can be the difference between good and great performance. As many of you know by now, Foundation Center and GuideStar joined forces earlier this year to become a new organization, Candid, . While new tools are still on the horizon, there are so many ways Candid can help you, as a nonprofit professional, do your job better right now. And many of those tools are free. Join Julieta Mendez, director of programs, and Gabe Cohen, senior director of marketing and communications, as they share some of our tools that will help build your organization’s capacity. And stick around after the demo for a chance to weigh in on how Candid can help you even more in the future. We want to hear from you, the nonprofits on the ground doing great work, on how we can help you move forward! Join fundraising master trainer, Chad Barger, CFRE, for a workshop focused on equipping and motivating your board members to be great fundraisers. You’ll learn how to help them get over their fear of fundraising and develop the fundraising habit. The session includes tools and samples that you can use to start building a fundraising culture within your board. No matter how effective your retention strategy is, some donors will stop giving. Every fundraising program needs a dedicated, ongoing acquisition initiative to replace those lapsed donors. This webinar will examine multiple channels for new donor acquisition and discuss how best to utilize each.